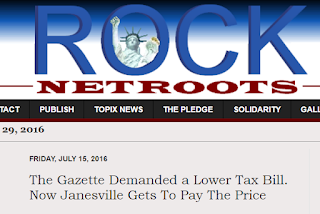 DemoCurmudgeon: Janesville buckles under to Big Business, now a Million Dollars in the Hole. Janesville buckles under to Big Business, now a Million Dollars in the Hole. Thanks to lower business property tax assessments in Janesville, the city is now $1 million short. Not too long ago, the Janesville Gazette posted anexclusive article about how some Janesville area big box retailers and other businesses are putting the squeeze on Janesville taxpayers by using a "dark store" argument to win substantially lower property tax bills. Some received settlements while others won lower property assessed values, refunds or both. the Gazette's parent label, Bliss Communications, hired a tax lawyer to, as lawyers are described in their editorial about the retailers, to "prey on the city" by filing an objection to their own property tax ... (resulting in) a $30,000 lower annual tax bill for the media company.